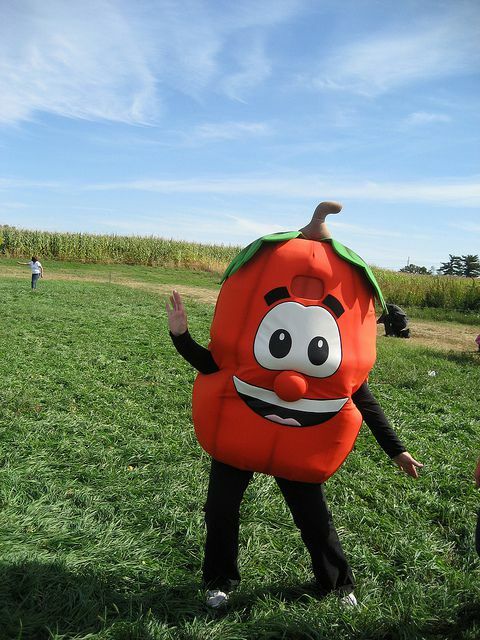 Summers Farm in Frederick, Maryland hosts a fall festival that includes a variety of farm activities including pig races, 65 x 45 foot-long jumping pillow, giant mountain slides, pedal-cart derby, pig races, Little Farmersville, pumpkin train, corn maze and concessions. See the following photos and get a glimpse of Summers Farm. Harvest Festival: September 24 – October 31, 2016. Maryland Pumpkin Festival - October 8-9, 2016, 10 a.m.-5 p.m. The weekend features the fall festival attractions as well as pumpkin hunts, egg hunts, a pumpkin sculpturing demonstration, face painting, an appearance by Mr. Brown the Clown, and more. Great Pumpkin Race and Fun Run - Sunday, September 24, 2016, 9 a.m. The race benefits St. Jude Children's Research Hospital. Walk, jog, or run in either the 5k race or the 1 mile Family Fun Run. Summers Farm, nestled among 100-acres in Frederick, Maryland, annually creates an expansive, specially-themed corn maze with winding pathways. For the 2016 season, contrived within 12 acres of 9­-foot tall corn, the enormous maze pays homage to a classic team that has cultivated great players over the years, including Cal Ripken, Jr., Brooks Robinson, Frank Robinson, Eddie Murray, and one of today’s top players Manny Machado. This year’s themed maze offers guests two distinct paths, a simpler stroll through the corn or one filled with more challenging twists and turns. Summers Farm Adventure includes a variety of farm activities including pig races, 65 x 45 foot-long jumping pillow, giant mountain slides, pedal-cart derby, the pig races, Little Farmersville, the pumpkin train, the corn maze and concessions. Dates and Times: September 24 – October 31, 2016. Kids love laying in the corn pit during the fall festival at Summers Farm. The giant hay slides at Summer Farm provide fun for all ages. There are plenty of pumpkins to pick at Summers Farm! Adults and kids participate in a variety of activities, including duck races. The jumping pillow is a favorite activity that visitors enjoy at the Summers Farm Fall Festival. Adults enjoy riding the pedal carts at Summers Farm. Everyone loves sitting in the big rocking chair at Summers Farm. Summers Farm has lots of pettable animals — Pigmy goats, "Baby Doll" sheep, miniature horses and donkeys, pigs, ducks, chickens, and bunny rabbits. Summers Farm Fall Festival includes a variety of farm activities including pig races, 65 x 45 foot-long jumping pillow, giant mountain slides, pedal-cart derby, the pig races, Little Farmersville, the pumpkin train, the corn maze and concessions. The Summers Farm Fall Festival offers plenty of activities to entertain the whole family.